The gear is not a big deal. I think you will get great results with cheaper camera and lens, but essential is a steady tripod. Just get out and try. 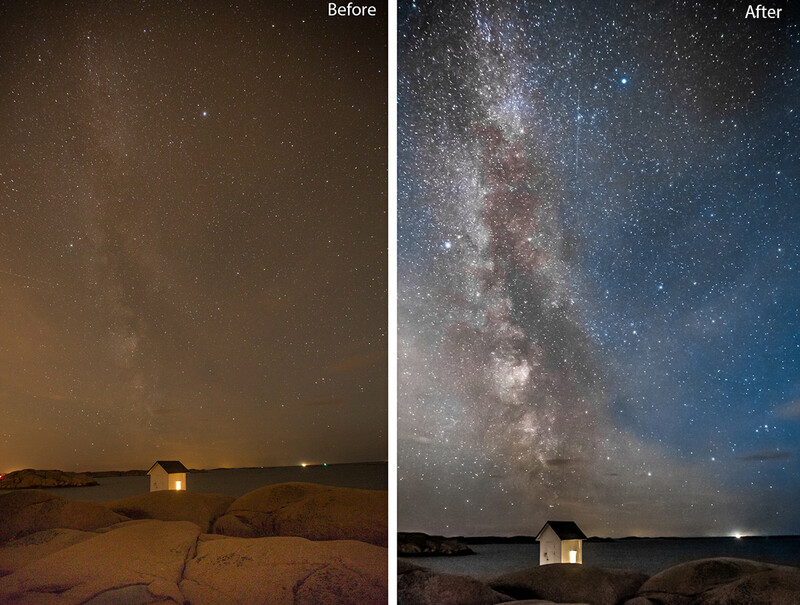 For it to be any idea even trying to capture the Milky Way, you should be in a dark place with as little distracting ambient light as possible. Check Blue Marble Light Pollution Map and find some dark locations to explore the night sky. I´m shooting nearby a city, and it works quite well. Furthermore, you should also keep an eye on the moon, if it is up or not, for the moon light can ruin a lot. Before I go out, I use a software called Stellarium. This program visualizes the sky and shows all the stars and celestial bodies, anywhere on earth, during any time of the day. 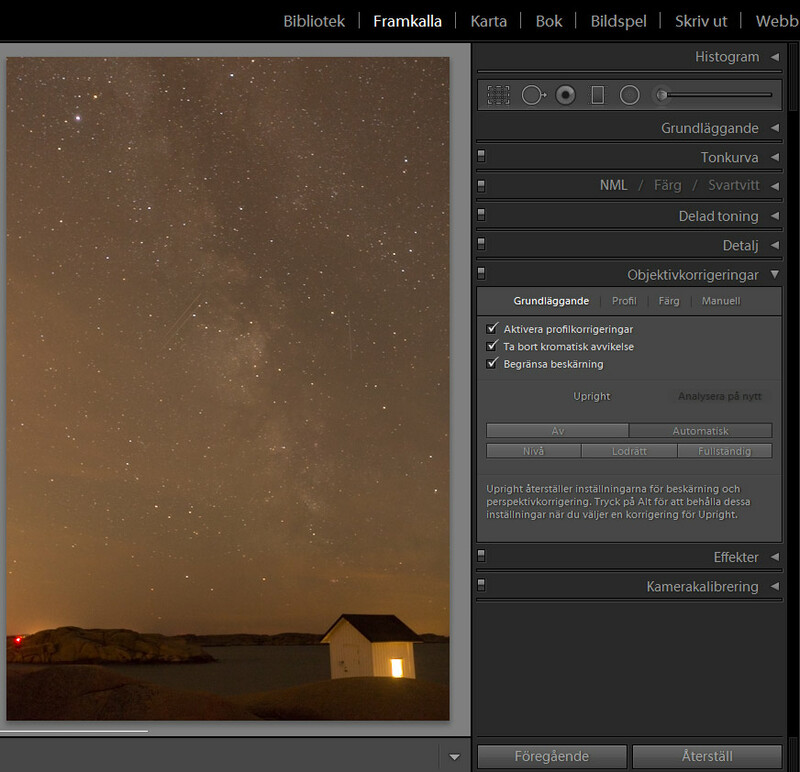 I set up my site, Lysekil, in this case, and change the time so it corresponds to the time I was planning to go out with the camera gear. 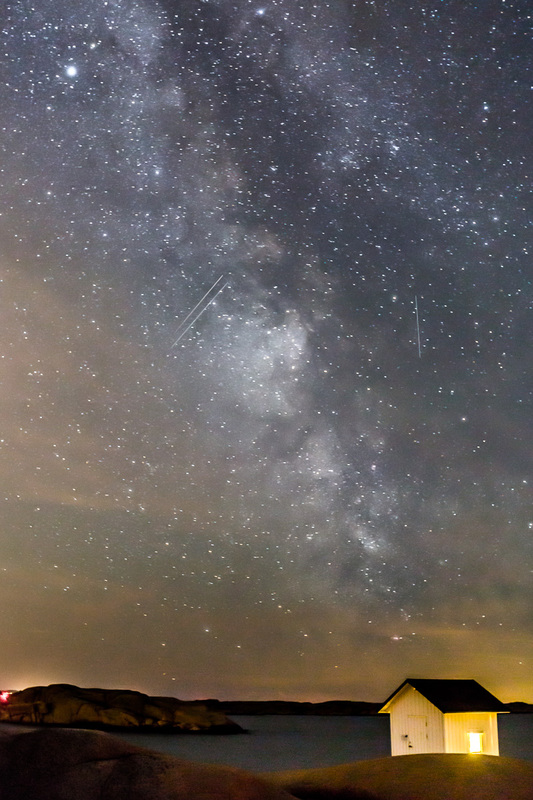 After this is done, you can easily see where the Milky Way is in the sky and if the moon shines or not. The program is simply an indispensable planning tool for me. Stellarium can be found here. I usually go out before it is completely pitch black, just for me to be able to compose the shot as I had imagined. When the location or locations are determined, I set up all the equipment and connect remote trigger and then start with the settings. First of all you have to focus so everything is sharp. I usually use the auto-focus function on something very far away. This will set the lens to infinity. Once this is done I change the button on the lens to manual focus and do not touch the focus ring throughout the evening. If you dont do this change, the camera would try to find a focal point in the pitch black night. And it will not succeed with that, believe me. Save as: RAW (certainly not JPG) in the highest resolution. 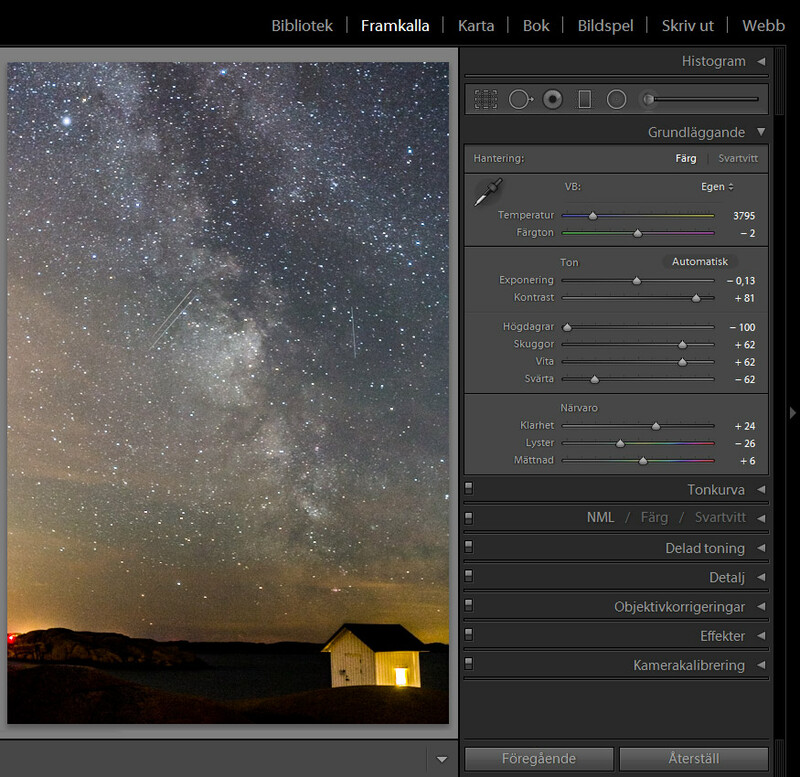 White Balance: Does not matter, that we can adjust in Lightroom later. Now that all settings are done, I directed the camera at the sky and uses the minimum focal length of the lens. In my case it is 16 mm. Then just pull the trigger and hope for the best, and in my case this was the result. How did this picture become? Quite good actually. 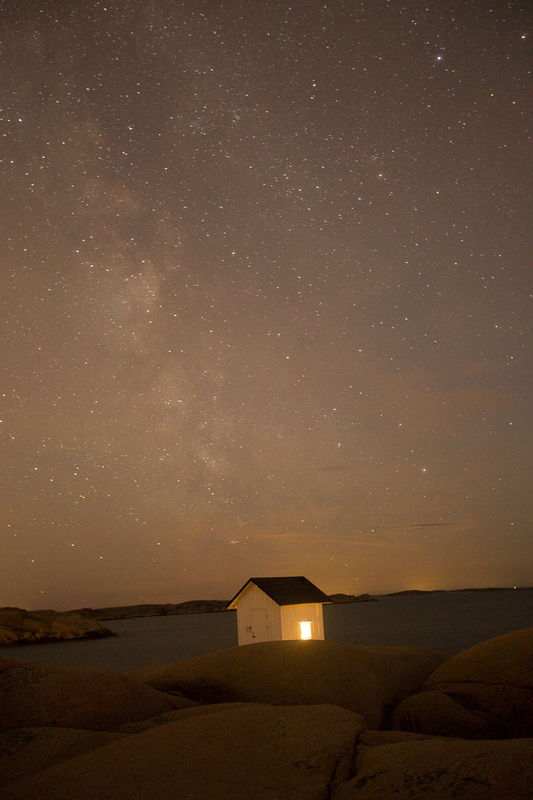 The advantages are that you can see the Milky Way quite clearly and also all the stars, and the picture is neifther over or under exposed, except the window of the lighthouse who has burned out. Likewise, I think the composition is good (others might think otherwise about this) but the problems outweigh, and you can clearly see how the whole picture is tilted, and it has a veil of yellow / brown light over the entire image. 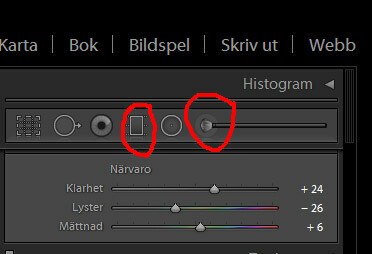 This we shall now fix in Lightroom. I assume that those who read this have some basic knowledge of Lightroom, and will therefore not explain in detail all of the tabs and the features of the software. Therefore import do you image into Lighroom appropriately, locate the image and opens the developer module of the program. I also state all the features in Swedish, for that is how my program is set. The first thing I usually do with the image is to straighten the horizon and apply corrections to counteract the distortion lens gives when shooting with 16mm focal length. Sometimes these distortions play no major role, especially if you have a lot of vertical or horizontal lines in the picture, these will be slanted or curved, and the picture looks weird. I go to the Lens Correction function. There I mark all three selections in the ”basic” tab. The software will then straighten out the horizon, but the house still leans a lot. This is a problem, and what I see on this picture, it´s leans a little too much for Lightroom to solve, so I let it be as it is and adjusts this later in Photoshop. Next step is to fix the lights and colors in the image. 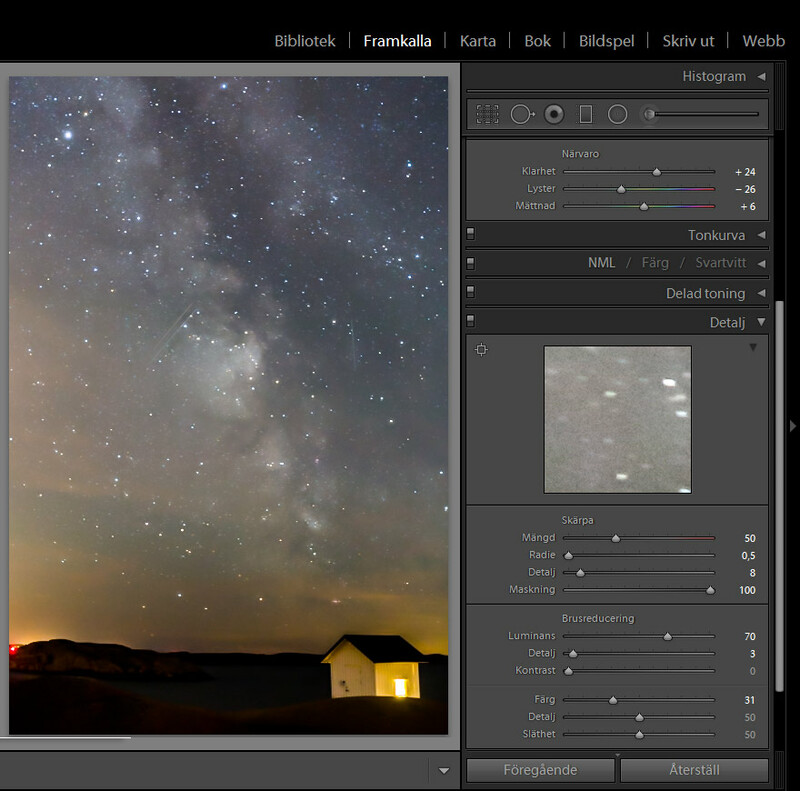 This provides a general adjustment and highlights the Milky Way, but above all it removes the yellow / brown blanket over the image. So I go to the ”Basic” and begins to drag the sliders. The adjustments I make are these, but they will differ quite much from your image. So depending on how your picture looks, adjust according to how you want your picture to look like. What did we get? Milky Way emerges very clearly. We get a colder expression in the picture, and the contrast and detail has increased significantly. Compared with the first unedited image a lot has happened, and remember that all this information has been picked up from the data stored on the camera memory card. In principle, this edit would be enough, and you would be happy with the result if you never done this task before, but we’ll pull it a few more times through Lightroom, and see if we can improve it even more. As I mentioned earlier, I have turned off all the noise reduction in the camera before I started. This should now be adjusted and this is done under the ”Details” tab. I show a magnification of the image and it´s have extremely much noise and makes the whole picture grainy. Not very beautiful, and it is a little difficult to clear the picture from all of this without losing details. I’m starting to drag a little in the controls and this is what I came up with on my image, but that said, it may be different on your images. 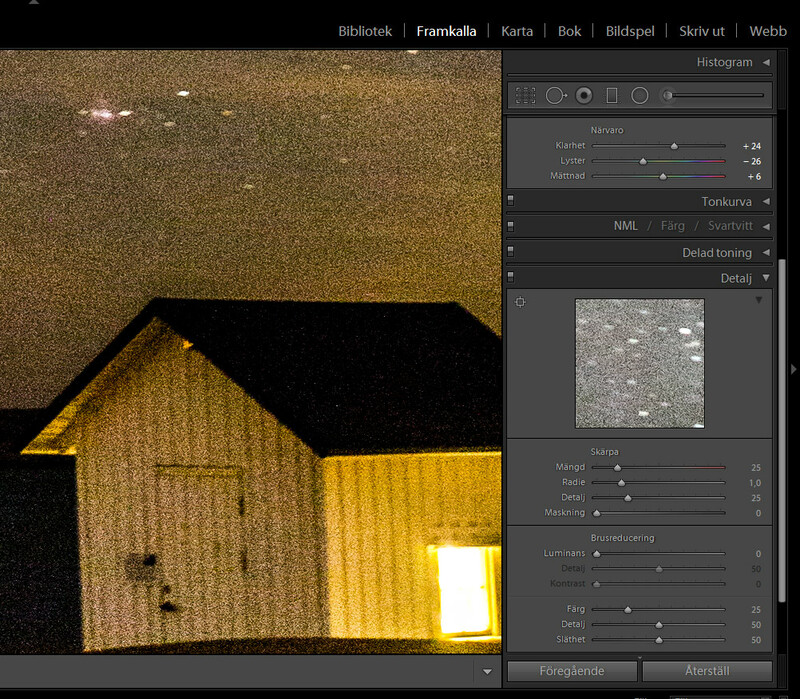 Once this is done, the image becomes much smoother and the noise has been reduced significantly. However, be careful regarding this adjustment, it will take away a lot of detail, and the conclusion is that, if you move the controls extremely you´ll end with a image that looks like a pastel painting. Now comes the final steps in the process of creating a galaxy. These steps include the features ”Graduated Filter” and ”Adjustment Brush” These can be found here in Lightroom. We start with the Adjustment Brush. Click on the function and then opens a small window that controls this particular brush. Start by increasing the exposure quite a bit so we can see where we paint into the picture. Also set the values for ”Feather” and ”Flow” to 100 ”and adjust the size of the brush to fit your image. 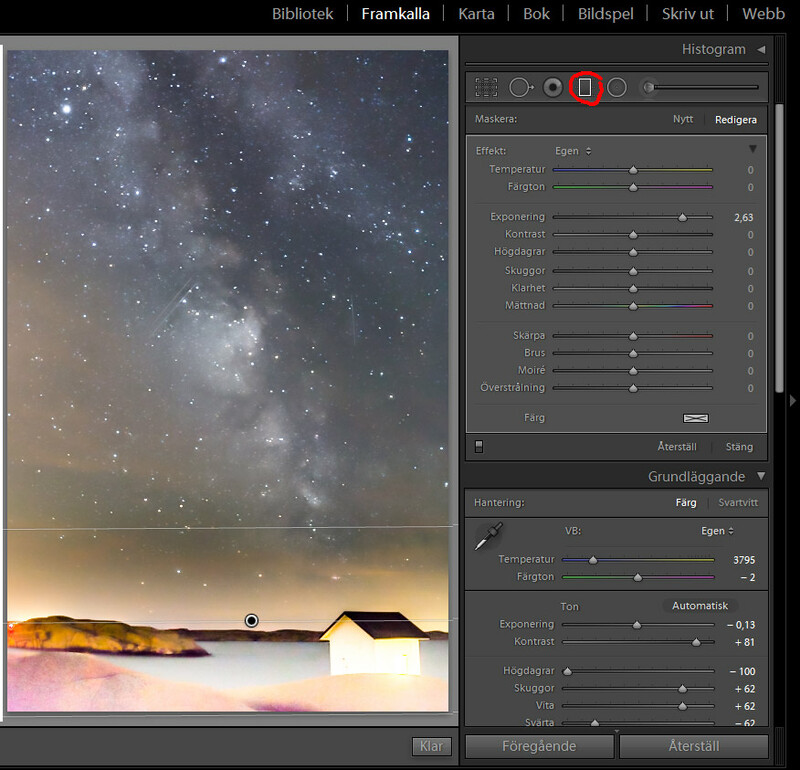 When this is done, you simply paint over the parts that the Milky Way is visible on. My picture shows two clear zones, and these are covered by my brush, and when it is finished, the result is this. After I painted the adjustment begins. These settings do I work on my image. What I did is highlight the Milky Way some more, adjust the colors and especially the temperature of the galaxy as it pops up a little more. The controls are sensitive so you have to watch out so it does not look tacked out and blends in with the rest of the image. Now it’s mostly finished, and what remains is to fix the foreground a bit. It is too dark and needs to be lightened up a bit. 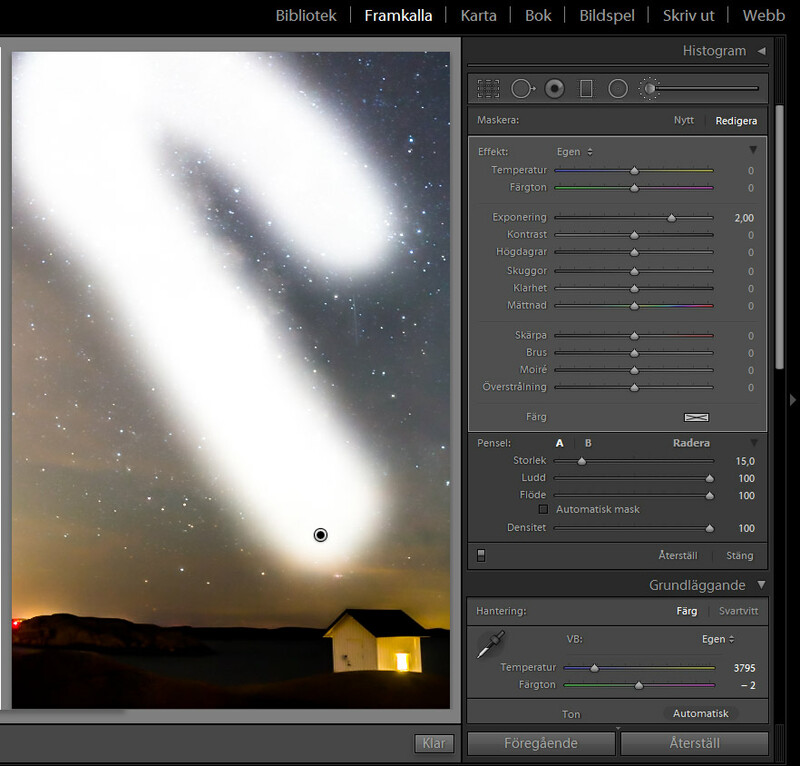 To do this, I use the tool ”Graduated Filter”. It works the same way as the adjustment brush, but adds a linear adjustment over the part of your image you want to adjust. Again, it may be appropriate to increase the exposure a lot so you see what you do and how far reaching adjustment. How did I do on my image? After all adjustments the result looks like this. It´s a difference compared what came from the camera. I would now try to adjust the light house so it does not lean so much, but this need to be fixed in Photoshop, and that editing you´ll need to find out by yourself. Of course you can do much more with the image. The house can be adjusted more. I think that it’s a bit too yellow and stands out a bit too much. The sky and the Milky Way can be adjusted to infinity, because there are many different wills and thoughts on how it should look. I just want to show that it is possible to pick up a lot of information from an image and emphasize parts of it, as in this case, the Milky Way. 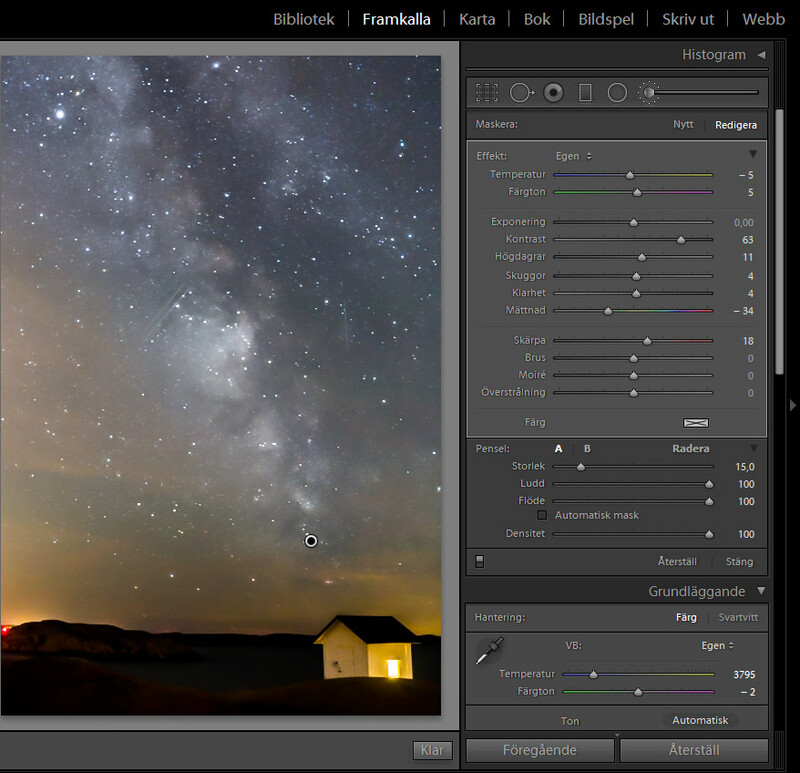 On similar images, I used the HSL tab quite a lot to enhance selective colors like brown-ish and purple. Not much, just to make the milky way clouds spark little more. All three sub tabs, Hue, Saturation and Luminance can be adjusted depending of the original color scheme on your image. Play around and see what all controls do. In this particular image nothing is done in those tabs. So don’t criticize me to much, if I failed on the adjustments. I’m just a simple self-taught amateur who just want to share some of my knowledge. fabulous tutorial and the most well explained I have found so far! Thank you! Can’t wait to head out to the beach and try it out.